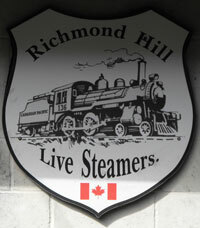 The Richmond Hill Live Steamers (RHLS) have 4 acres of treed lot north of Toronto, Ontario, Canada. They used to hold open house weekends twice a year, once in July and once in September. Hundreds come to ride the live steam trains. The crowds became so large they had to cancel the open house weekends. Pity. There are two separate railways: one at ground level and one that has elevated track. This video focuses on the larger scale trains that operate at ground level. There are both steam engines and diesels pulling the trains. Ken Douglas, a fellow member of our NMR HO modular club joined me to make the trip to the other side of Toronto to see and ride the live steam trains. Richmond Hill, a northern suburb of Toronto, is about two hours east of Collingwood and Wasaga Beach where we are located. There were some amazing locomotives. The club was even doubleheading coal-fired live steam engines. 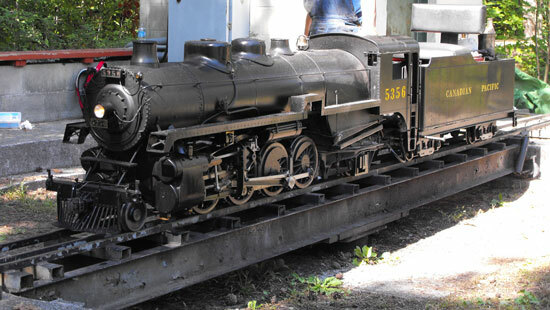 Locomotives could be worth as much as $25,000. Ken and I attended the September, 2011 open house on Sunday. The weather was perfect and the air was scented with coal smoke. 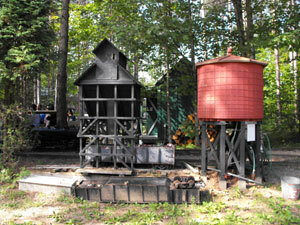 Here are some live steam pictures of the rhls set-up. Here is the video I took. It's a long train ride around the 4 acres. More train videos can be accessed through my train videos overview page. There's a second video of the smaller, elevated trains including some British locomotives. 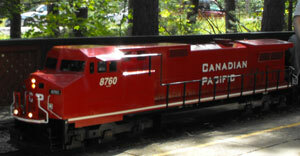 Go from "live-steam" to a video of the smaller trains on the elevated trackage at RHLS live steam trains. Return from "live-steam" to my Home Page.